Sadie M. Ingalls was a member of the Sac (Sauk) and Fox Tribe in Oklahoma. There are three recognized Sac and Fox groups in the US: The tribe of the Mississippi in Iowa, the nation of Missouri in Kansas and Nebraska, and the nation in Oklahoma. 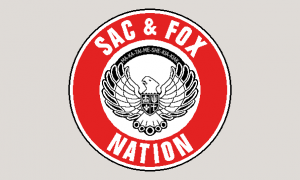 The Fox and Sac tribes joined in in close alliance in 1734. The two tribes are very similar, although they maintained separate identities well into the 20th century. The tribes were comprised of both farmers and hunters and raiders. 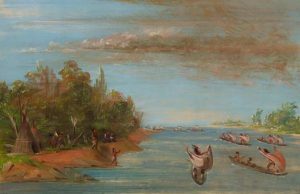 The fox were the only Algonquin tribe to war with the French, nearly decimating their numbers. While several cultural hero tales of the Sac and Fox exist to this day, no legends about crows can be found. Crows are often portrayed as Tricksters, as in a story from the San Francisco chronicle published in The Red Man. In this story “Origins of the Mountains of California according to Indian Legends” three birds exist in a land made up of only water. The Hawk and the Crow take some mud a duck has brought to the surface and use it to make mountains. The hawk looks over at the crow and realizes the crow has cheated him out of his share of mud. The crow is unrepentant and mocking. Here the crow is a classic trickster, acting from greed and hunger to fool another for his own gain. The actions of the crow and his motivations are similar to Sadie Ingalls’ characterization of the crow, however she describes none of the rude, mocking character typical of a trickster. This entry was posted in Sadie M. Ingalls, The Conflicted and tagged animals, crows, Indian Boarding School, Legend, Tribe, Trickster. Bookmark the permalink.